This new and exciting learning experience allows students and teachers anywhere in the world to take a "Real Time" "One On One" video interactive private brass lesson with Wayne Downey via the Internet. 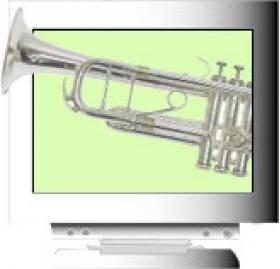 "CyberLesson" - Students and teachers can benefit incredibly by scheduling a private video interactive brass lesson with Wayne Downey at their own convenience. Price includes a full one (1) hour private brass lesson. A private brass lesson to evaluate your current solo, etude or characteristic study. An evaluation of your strengths and weaknesses in 7 important areas of brass technique integral to the success of All State, Drum Corps and school seating auditions. An in depth study of Wayne's XtremeBrass techniques in easy to read paragraph form. A rehearsal plan complete with practice tips and suggested etudes and exercises. "SuperStar Etudes" 20 of Wayne's original etudes for brass free of charge. Answers to any pertinent questions the student might have concerning the development of his/her performance skills. Scheduling a CyberLesson "Is As Easy As 1-2-3"
Login to Skype at the agreed time for your lesson.